What is Range Camp: Range Camp is a week-long summer camp that provides high school students an opportunity to learn about rangeland ecology and management, and livestock management. 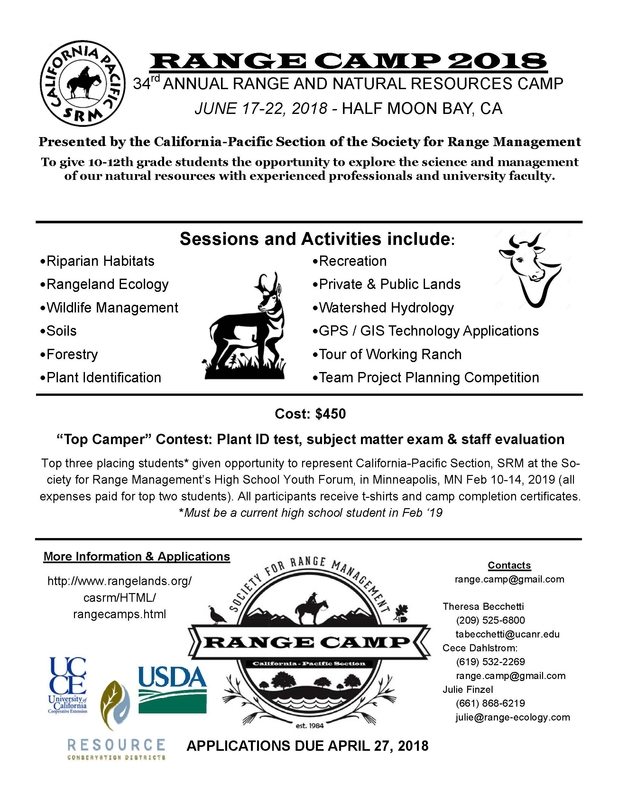 They learn from academics and professionals in a variety of fields including range management, livestock management, soils, fire, botany, wildlife, and more. Who can attend: High school students who have completed their freshman year. Students can be from anywhere in the state. Students come from a wide variety of backgrounds - some are from ranching families and some are from cities or suburbs and have never been to a ranch. Cost: $450. However, most students get full scholarships from their local Resource Conservation Districts (RCD's) or other local groups. Click here for a link to the pdf version of the flyer.